Q. Do you have books on computers, computer software and computer programming? 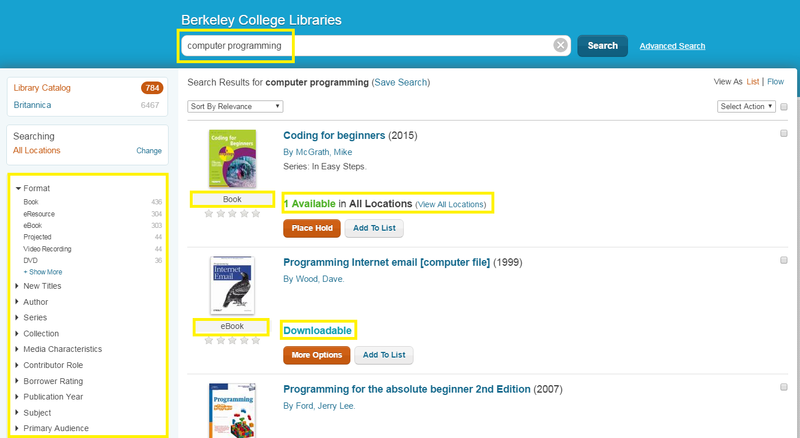 Use the library catalog via the library page on Engage or in your Canvas course to find books on computers, computer software (Microsoft Office software applications), and computer programming. Use the words embedded in the question ("computers," "computer software," "computer programming" and also "Microsoft Office," "Microsoft Excel," "Microsoft Word," etc.) as keywords in the library catalog search box. An example search is shown below. Once a results list is generated, you can view each item to check its status (for location, call number and whether the book is available or checked out). You also have the option to place the book on hold to be delivered to a specific campus. Once logged in to Engage, click on the Library tile to go to the library homepage. Then, click on the button for Library Catalog. In the new window, you can then use the search box to search through the library holdings of books, e-books, and more. Searching for "computer programming" brings up 784 results. You can use the sidebar on the left to narrow down by format, author, year, etc. Each item in the result list is labeled with the item's format (book, eBook, etc.). You can also see if item is available, checked out, or downloadable.